Would you like to easily answer calls without touching your phone? Now that's possible with Air Call Answer ! Samsung had already enabled something similar in their latest devices and now comes to the vast majority of phones: Air Call Answer allows us to answer calls without touching your phone as long as the device count on a proximity sensor (most phone incorporating it). With this application we can answer calls by simply passing your hand in front of the proximity sensor or just taking the phone to our ear to talk directly. We can also configure Automatic Speaker mode that will activate the speaker to answer the call, a very useful option for when you have your hands full. Now, surely some of you are thinking, what if I have my phone in my pocket? Are the calls are automatically contestestarán if my hand goes near the proximity sensor? The answer is no. Air Call Answer PocketMode includes avoiding such problems. This application also enable / disable vibration alert and the call message on the screen. 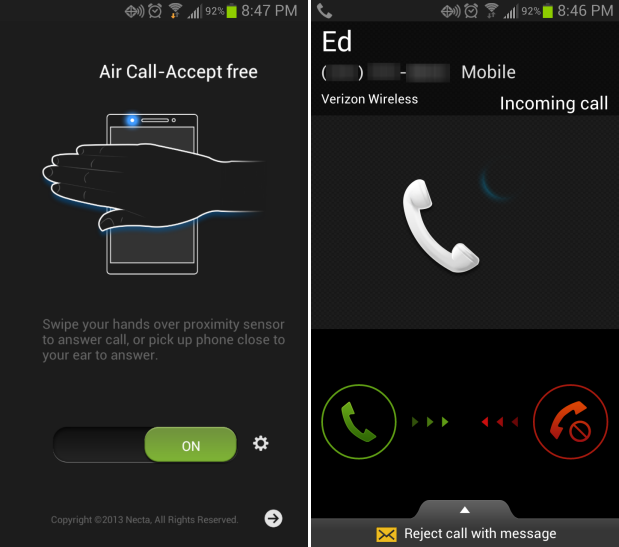 Air Call Answer can be downloaded free of charge from Google Play. It is an application that is still in development but it also represents a good option to change a bit the way we answer our calls. Related: Which VoIP Apps are the Best for free calls?